Just another week of fury in the coverage of higher education in the British media. On Wednesday The Telegraph was celebrating the fact that half of the students starting this year are the first in their family to go to university, and it seemed like all was well in the world. But in Britain, every patch of sunshine has a Storm Brian on the horizon. So along came The Guardian on Friday, barracked along by the BBC, to hammer Oxford on its record on social inclusion. Give it a few days and Storm Lammy will blow over, the Daily Mail will publish a piece on the evils of contextual offers – as, let’s remember, they do – and we will stumble into another round of undergraduate admissions no wiser than we were at the outset. What an absurd – yet, in this country at this moment, absolutely typical – way of handling a hugely important social and educational issue. So, yes, I feel a little bit sorry for Oxford. But I also think they – and other universities that could so easily be the focus of attention next week – could learn something from this. Universities waffle when it comes to contextual offers (i.e. lower offers for students from disadvantaged backgrounds). Maybe that’s for good reason, since we sail between Scylla and Charybdis, The Guardian and The Daily Mail. Maybe it’s because central governments have been too spineless to give us some cover from the latter by speaking out in support of such offers. But we waffle. I’ve waffled myself at open days. Yet there is solid evidence that underpins contextual offers: have a look, in particular, at anything from the Bristol Widening Participation Research Cluster. There are limits, of course; a student entering Oxford with A-Levels at CCC is probably more likely to drop out than to succeed. But the research supports making offers roughly two grades lower than standard for a course to students from under-performing schools and colleges. They will catch up. But I’m amazed how opaque we all tend to be about contextual offers and the basis upon which they are made. My sense is that quite a lot of universities make them, but I’m much less convinced that potential applicants know about them. Surely transparency matters. Which brings me to the Oxbridge interview. In practice, in the hands of skilled and sympathetic interviewers, I’m sure these can be a mechanism for making very generous contextual offers. I’ve certainly heard stories along these lines, while I know A*A*A* applicants from private schools who have been rejected. But it seems to me that this happens at the expense of consistency and transparency, and as a result all the good work is scattered in the wind. I wonder whether someone at Oxford has studied what would happen if they scrapped their interviews. The other big issue with interviews is: how many potential applicants do they deter? I’ve had proponents of the Oxbridge interview tell me over and over that they are socially progressive: a way of weeding out the well-coached but intellectually vacuous privately-educated applicant. But is the working-class Islamic girl in Newcastle hearing this message? Or is she listing other universities on her UCAS form? I heard a black Cambridge student on ‘The World at One’ yesterday talking about her interview experience. It was fair, she said, but she was glad to have been through an access programme that included interview training sessions. Well, precisely. Access programmes are fantastic and we should do more to publicize them, but they’re also costly and by nature patchy in their coverage of the population. If students like that one need the benefit of an access programme to demystify the Oxbridge interview, I’d suggest they have a problem. These problems are compounded by the existing lack of cultural diversity. If I was that Islamic girl in Newcastle, I could quite imagine thinking that Oxford isn’t for me. Let’s face it, the public face of Oxbridge is white and comfortable; and much of the rest of the Russell Group – step forward my own university – is pretty similar. Who really wants to be the first black student in six years to enter the gates of Merton College, Oxford? What do universities like mine have, that will attract socially disadvantaged and ethnic minority applicants to us? This is a huge challenge, but not one that I’ve yet seen any place tackle in an exemplary manner. Who is the outstanding Russell Group PVC with responsibility for cultural diversity? Any answers? Which university has stood back and really asked itself what it needs to do to make itself more welcoming – more of a home – to its ‘non-standard’ applicants? We’ve all addressed this question in relation to international students, so surely it’s possible to change if we really want to do so. 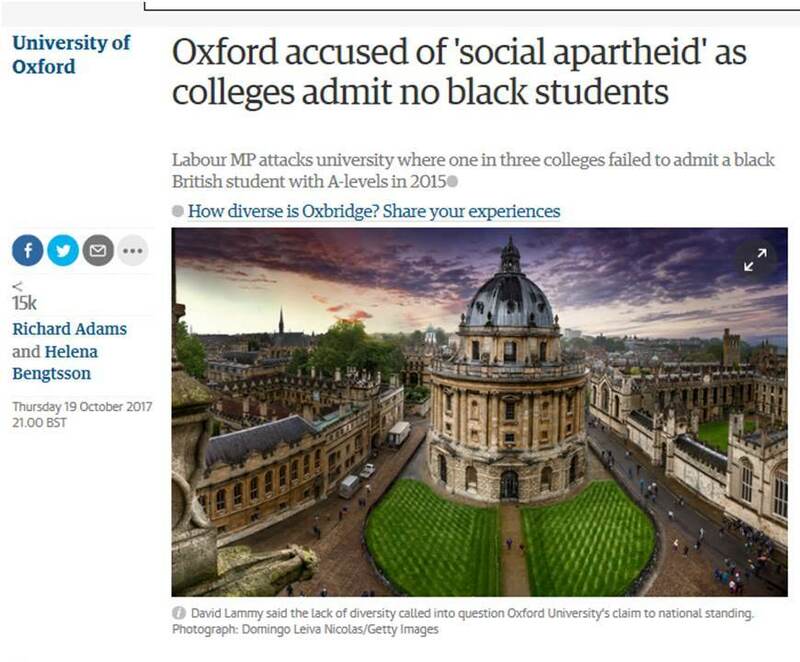 Let’s face it, the presence of Cecil Rhodes at Oxford doesn’t help, especially when an MP is accusing the University of ‘social apartheid’. I appreciate I’m in the minority, but I’d be doing something about that, because symbolism matters. Other universities can start with more of a blank slate, though still facing some undeniable challenges in terms of location, reputation, and so forth. Cultural change is hard – indeed it makes fiddling around with contextual offers look easy – but crucial if we really want to shift patterns of application. Excellent blog. Thank you for speaking up in this way. That is, I feel, the most important point. At each of the “ancient universities” I have been at (Oxford, Cambridge, St Andrews), there is a tendency to talk about being welcoming, right up to the point where it might have an effect on the “standard” applicants, many of whom want to pomp and poshness. For example, I seriously suggested at least one picture of students in tracksuits (and not just doing sports), less in suits, gowns and designer clothes, in our promotional material. That suggestion was (of course) taken as an hilarious joke.